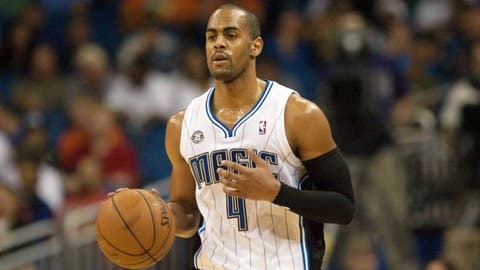 Arron Afflalo was one of four members of the Magic to play all 24 minutes of the second half Monday night. ORLANDO, Fla. — It would be tempting so close to Christmas to say Arron Afflalo, Tobias Harris, Jameer Nelson and Glen Davis found the strength of 10 Grinches plus two Monday night. But that would be overlooking what they and the rest of the Orlando Magic accomplished in the first half of their 103-98 loss to the New York Knicks — which was pretty much next to nothing. Anyone who understandably turned off the game when the Magic found themselves down 65-41 at halftime must have done a double-take upon learning they had made it a one-possession game on several occasions in the fourth quarter. At the risk of slighting Nikola Vucevic — who finished with 14 points, 12 rebounds and three blocked shots — most of the credit should go to the other four starters who played all 24 minutes over the final two periods. "The unit that was out there was making a run," said Harris, who was still trying to overcome a nagging ankle injury less than two weeks ago. "So at that time, you’re not worried about anything. It’s a lot of minutes, but at the same time, we came back and fought strong. At that point, you’re going on emotion and just energy." During a timeout late in the third quarter with the Magic having trimmed the Knicks’ lead to 78-70, coach Jacque Vaughn said he made a conscious decision to stick with his starters. This was not going to be a night where Andrew Nicholson, Maurice Harkless or even Victor Oladipo would be thrown into the fray. Magic Musings: Ken Hornack breaks down how Orlando's late rally came up just short against NY. Recap: Magic pull withing single digits in fourth quarter but lose again as skid continues. Aside from Jason Maxiell, whose tip-in made it an 84-83 game with more than eight minutes remaining, no one came off the bench after the game changed from a blowout to a nailbiter. "We didn’t come in here on our home court and just lay down," said Afflalo, who scored 16 of his game-high 26 points after halftime. "Giving a fight doesn’t mean much to me. But it’s worth something." It also didn’t hurt that Carmelo Anthony, who has led or tied for the lead in scoring in every game this season for the Knicks, sprained his left ankle in the third quarter. "Let’s not forget their best scorer was out of the game," said Harris, who was visibly deflated when Anthony hit a 19-footer over him to end a nightmarish second quarter for the Magic. "Other guys play off of him pretty much all game," Afflalo said. "So when he goes down, there’s not necessarily confusion, but guys are thrust into different positions and mandated to produce." The Knicks managed only 19 points in each of the last two quarters. With J.R. Smith suddenly going cold and with Raymond Felton joining Anthony among their walking wounded, they had to depend on Andrea Bargnani and former Magic point guard Beno Udrih down the stretch to avoid a loss which could well have cost embattled coach Mike Woodson his job. "I told the guys after the game that I’m not that good of a coach for us to dig a hole like that and try to fight our way back into games continuously," Vaughn said. "What I do like is the kind of frenetic, maniacal approach that we had in the second half that got us back into the game." Davis, firing away at will, scored 13 points over the final two quarters and finished with 20. Nelson had probably his best all-around game of the season with 17 points, 10 assists and eight rebounds. And after the Knicks put on another 3-point shooting clinic at their expense in the first half, they went only 1 of 6 from that distance after Anthony’s exit. "We were able to build some confidence off our stops, which is the way it should be," Afflalo said. "We really simplified things in the second half," Vaughn said. "I think we ran three plays at the most, maybe." What the Magic need to figure out before Friday night’s game against the Detroit Pistons is how to give that same kind of effort from the opening tip instead of continuing to let other teams have their way early on. "I think any fan could have gave us a speech at halftime — are you going to show up and play or not?" Afflalo said. "There’s not too much rah-rahing you can do when you’re down 24. You know what needs to be done." Unless that changes, the holidays won’t be very happy. "I hate losing," said Harris, who has seen more of it over the past month than the Magic and their fans can bear.